Support Mapclick to see where voters would vote for you! Which of your friends are most similar or opposite of your beliefs? What would make your results more accurate? Your political beliefs would be considered strongly Right-Wing Libertarian on an ideological scale, meaning you tend to support policies that promote free market capitalism and smaller government. You side moderately towards “Assimilation”, meaning you believe we should be a unified culture. This theme is more important to you. You side extremely towards “Small Government”, meaning you very strongly believe the government is overly bureaucratic, inefficient, and wasteful. This theme is more important to you. You side extremely towards “Laissez-faire”, meaning you very strongly believe government intervention in economic markets leads to long term negative results. This theme is more important to you. You side moderately towards “Capitalism”, meaning you support an economic system that features private ownership of wealth. This theme is more important to you. You side strongly towards “Individualism”, meaning you strongly support free market policies that create opportunity for personal liberty and success. This theme is more important to you. You side strongly towards “Deregulation”, meaning you strongly believe that government regulation stifles innovation and economic prosperity. This theme is more important to you. You side moderately towards “Politically Incorrect”, meaning you believe our society is becoming too sensitive to language that is direct and honest. This theme is more important to you. You side moderately towards “Tough”, meaning you believe in tough love and have little sympathy for those that break the law or make bad choices. This theme is more important to you. You side moderately towards “Traditional”, meaning you believe we should be a civilized nation that honors traditional morals and values. This theme is more important to you. You side extremely towards “Meritocracy”, meaning you very strongly believe important decisions are best made by those with the most experience and knowledge. This theme is more important to you. You side moderately towards “Security”, meaning you believe the government should do everything within its power to ensure the security of its citizens. This theme is more important to you. You side strongly towards “Nationalism”, meaning you strongly support policies that prioritize the interests of our nation above others. This theme is more important to you. You side extremely towards “Decentralization”, meaning you very strongly believe that administrative power and decision making should be handled at the local level and serve the best interests of the local community. This theme is more important to you. You side strongly towards “Anthropocentrism”, meaning you strongly believe humankind is the central element of existence. This theme is more important to you. You side slightly towards “Protectionism”, meaning you more often believe globalization is detrimental to the safety, compensation, environment, and standard of living of workers. This theme is more important to you. You side slightly towards “Religious”, meaning you more often support policies that reflect religious values and principles. This theme is more important to you. You side moderately towards “Right Wing”, meaning you support policies that promote economic freedom and a society based on morals and values. This theme is somewhat important to you. 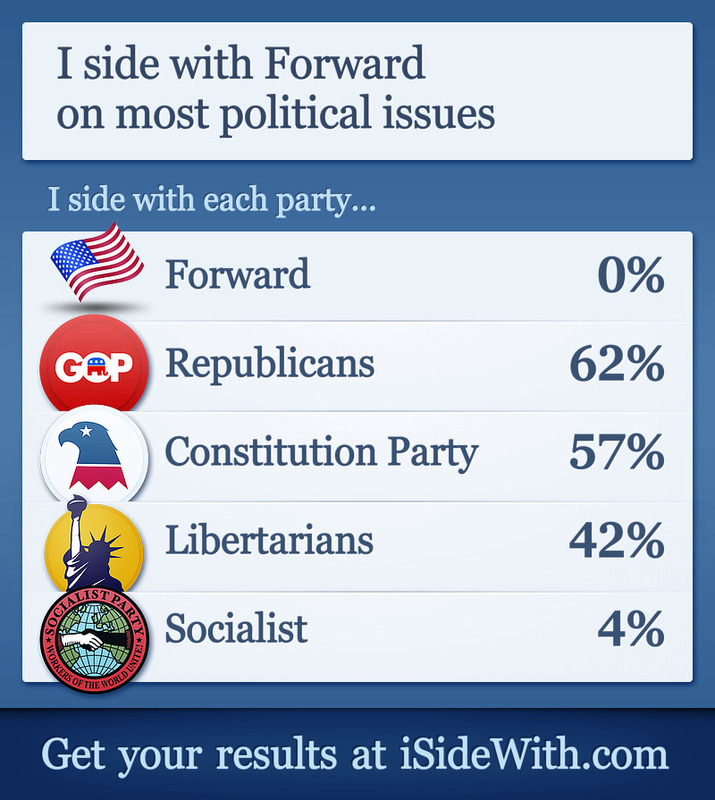 You side moderately towards “Libertarian”, meaning you support policies that promote social and economic freedom. This theme is somewhat important to you. You side strongly towards “Unilateralism”, meaning you strongly believe policy decisions should be made solely by those who are most affected by the outcome of the decision, despite opposition from those who are less affected or not affected by the outcome of the decision. This theme is somewhat important to you. You side moderately towards “Isolationism”, meaning you believe we should focus attention on our most pressing issues at home instead of involving ourselves in non-threatening issues abroad. This theme is somewhat important to you. You are a centrist on Pacifism and Militarism issues. This theme is somewhat important to you. 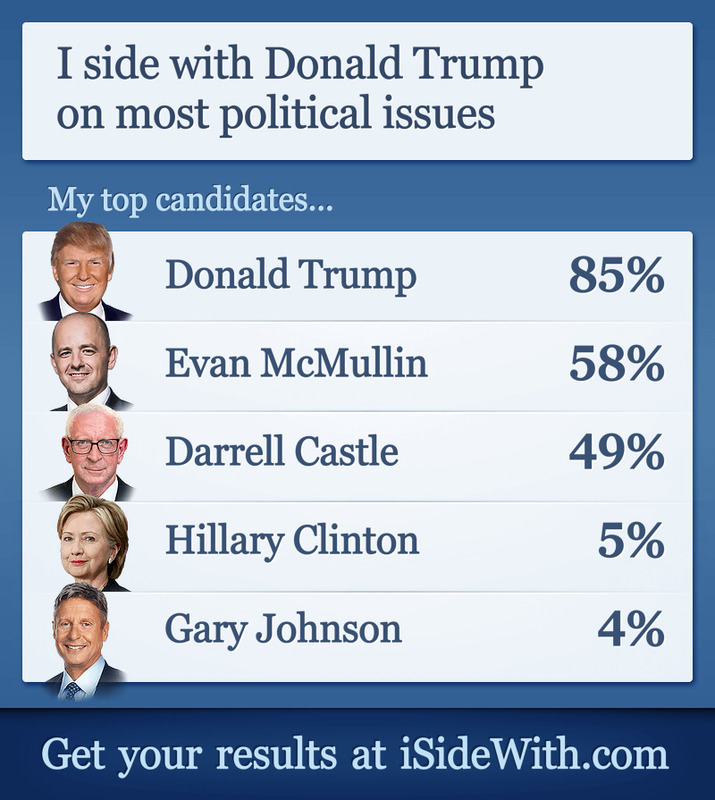 Which friend do you politically side the most with? Connect to Facebook to find out! Share us with your friends and see how many you can inspire to reexamine their political beliefs.